Which movie has the best endings? Some of the best movie endings that I like are Batman Begins(I like the line "and you'll never have to") Armageddon Cruel Intentions(with the song in the end and the driving scene) Pirates of The Caribbean 2 (with the appearance of the captain) Lethal Weapon 1(really brings out the feeling of X'mas) The Godfather (with the closing of the door) The Crow The Jacket(both of them in the car with the sunshine) Lost of the Ring 1 Actually there is more but let's say what's your favourite endings? i think from all the movies that i have seen the godfather has the best ending according to me. even the overall movie is very nive and the way the whole story unfolds is a very nice thing to expericence. it is my best movie and the ending is one which will stay in ur mind for ever i think. the ending shows how michael start to take the position of the godfather and that he is being respected by the people like a godfather. really, i think people should for once see this movie. I remember this scene too, in the Godfather part I. Very impressive. well, i do watched those movies that been listed by you. before i watch any movie i do make sure all of them are best ending movie cuz i really hate to watch some sad ending.lol.so far i just watched 2 sad ending movies.that's all.the movie that i really love most (best ending movie)is MATILDA. it was directed by danny davito. the story goes about the value of the true love (family). just showed up a very bad surroundings where in order to make sure a kid will be in the right manner he must get the right guidance,full of love and spirits from the family. i do recommend on MATILDA. you won't feel like you waste your time if you watch it. 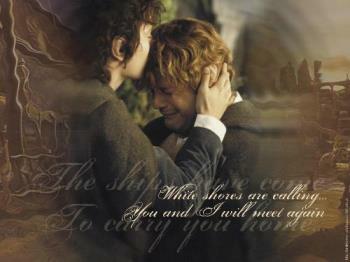 I love this ending in Lord of the Rings: Return Of The King When Frodo sail off with Gandalf and the other, leaving Sam to write the last reamining pages of the book.I agree with ur choice, the cruel intetions ending was very cool, i loved the song bittersweet symphony and the was very hot. LOTR is great movie. Cruel Intentions ending is just right, with the song and the screen, just match. The movie itself is just average but how they handle the ending is excellent. If you've ever seen The Usual Suspects I think you would agree that it has one of the most amazing endings of any movie. I also enjoyed the twist ending of The Sixth Sense. my boyfriend and i hated the ending of pirates of the caribbean 2. it was so hanging! we like the endings of shawshank redemption (a great movie about hope and determination as well as trust and friendship), patch adams (an old person, played by robbin williams, still trying to pursue a career as a doctor) and 50 first dates (where it is proven that love is without limitation). There are 2 movies that spring to mind immediately when talking about great endings. The first would be The Sixth Sense...didn't see that coming at all and the other is Angel Heart...this is a movie that looks like it's going nowhere for 90 minutes and then BOOM! !...what a finish. Cool, you've reminded me of Angel Heart!! The ending is really awesome. Sixth Sense is also good, pretty surprising at the end. For twist endings, Jacob's Ladder was great. I thought After Sunset also had a great ending. The Illusionist, I loved the ending of that one. Dandelion also had a great ending, it set a tone without tying up all the loose ends in a neat little knot. I like endings that give you an idea of where the story will go after the picture fades to black, without resolving everything, since real life rarely works that way. i think the pirates of carrebian second has best climax. i am talking the appearance of captain in that movie. it suits the movie very much. so it has best climax.